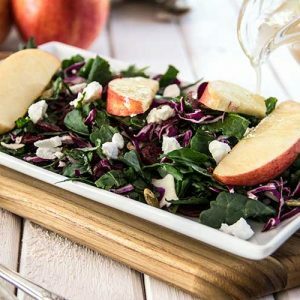 My favorite kale salad, ready in 7 minutes and exploding with fresh autumn flavors: salty pumpkin seeds, crisp apples, creamy goat cheese, and an easy maple dressing that’s tart and sweet. I’m guessing that a kale salad is the thing everyone reaches for when they want to the most health-supporting, nutrition-packed option possible. When you want to make a good solid healthy choice for yourself, a kale salad earns you the gold star. Has anyone ever gone for a kale salad when searching for something flavor-packed and guaranteed delicious? I don’t believe this has happened once, at least not in my life. In fact, a kale salad used to be the opposite of everything I’d imagine to be flavor-packed and guaranteed delicious. 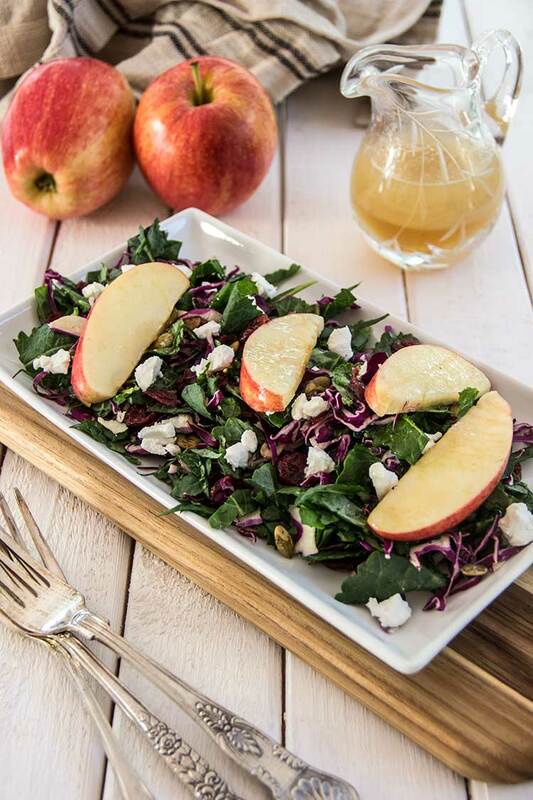 Until I came up with this autumn apple kale salad, which happens to be bursting with tasty, creamy, crunchy, tart, salty, and sweet fall flavors. My husband Chris, who I don’t believe has ever had any desire to eat a kale salad ever in his life, even raved about the tastiness of this recipe. The added bonus to this kale salad is that it’s really quick and easy to make in under 10 minutes. So it’s the perfect light lunch or simple side when you’re looking for something both healthy and amazing-tasting too. Just grab a bowl and combine some sunflower oil (which has a delicate, neutral flavor), along with some apple cider vinegar and maple syrup. Season the dressing with salt and pepper and whisk it up until it’s well combined. 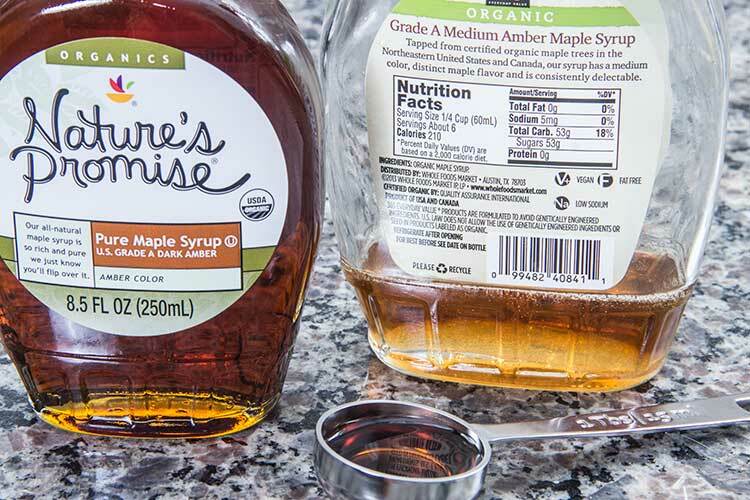 For the best flavor and nutrition, look for 100% pure maple syrup. You’ll know it’s the real deal when the only ingredient listed is maple syrup. 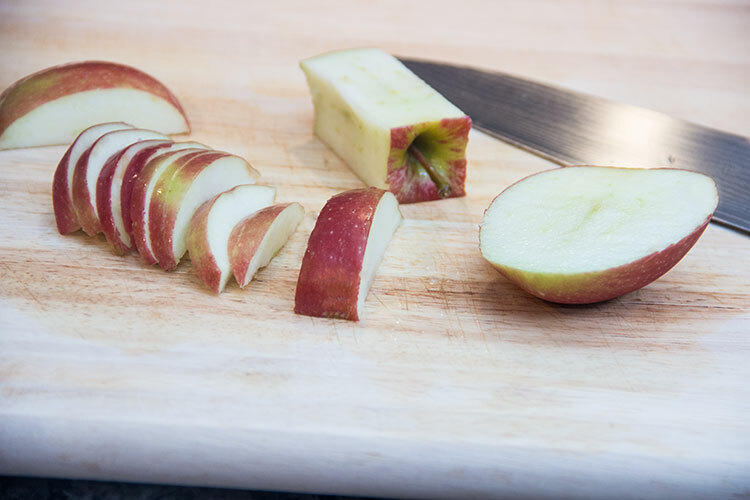 Use any flavor of apples you like best. 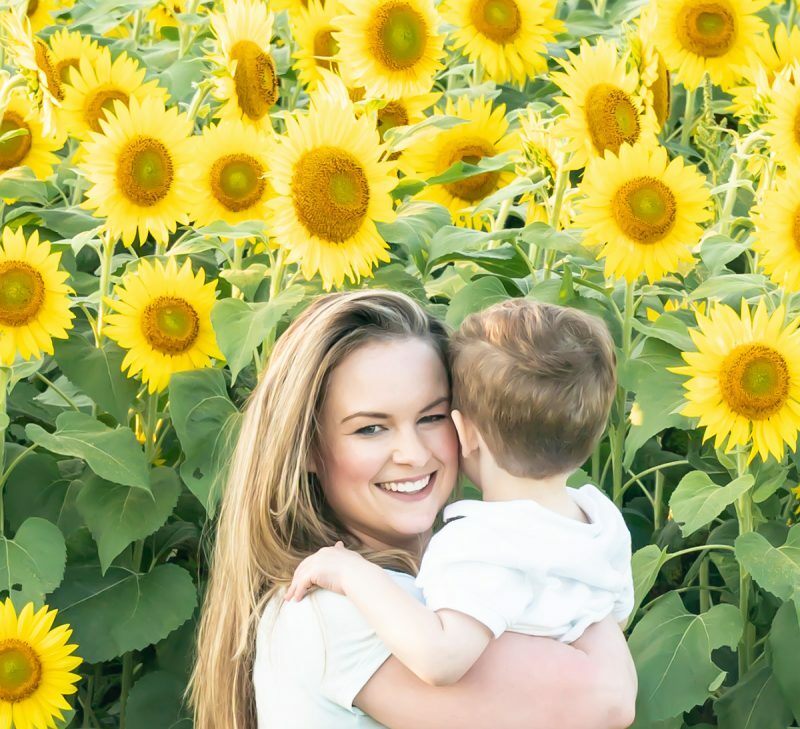 I’ve used honeycrisp apples for the photos here, which are very sweet. My favorite type of apple for this kale salad, though, is macintosh. They’re a little tart and a little sweet. I highly recommend baby kale for this recipe. It’s less tough and chewy than regular kale. 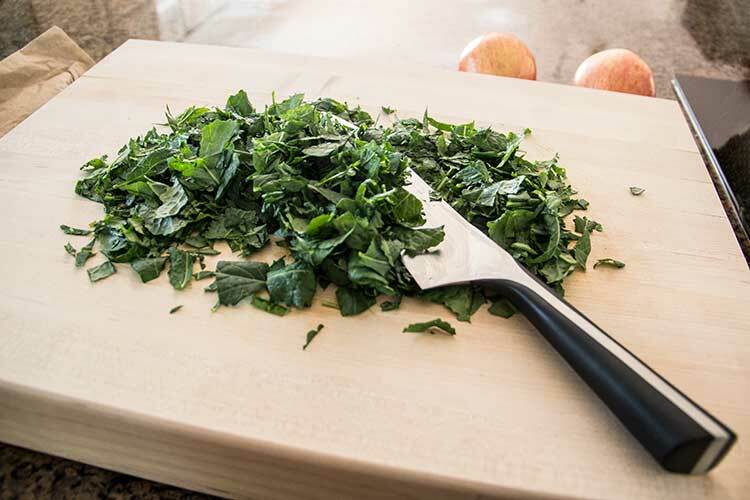 Just be sure to pile it up on a cutting board and run your knife through, chopping it into little bits. Just toss the chopped kale and shredded cabbage into a big bowl. Add the sliced apples, some dried cranberries, and the maple dressing. Then mix it all up until the salad is nicely and evenly coated in dressing. Be sure to add the two keys to flavor in this salad: toasted and salted pumpkin seeds and crumbled organic goat cheese. If you’re going to skip ingredients in this salad, don’t let if be these two! They’re the stars of the show. The goat cheese adds the rich creaminess that makes this salad irresistible and addictive. And the pumpkin seeds add important saltiness to contrast with all the sweetness of the maple dressing. This one earns the gold star for healthy nutrition for sure! But what makes this autumn salad special, I think, is the combination of yummy fall tastes and textures. Autumn is – hands down – my favorite season for weather. But also for food. And this kale salad highlights why. The tart apples, the crisp kale, the savory pumpkin seeds, the sweet maple, the chewy cranberries. They all contrast against and yet also complement one another in the most additively delicious way. 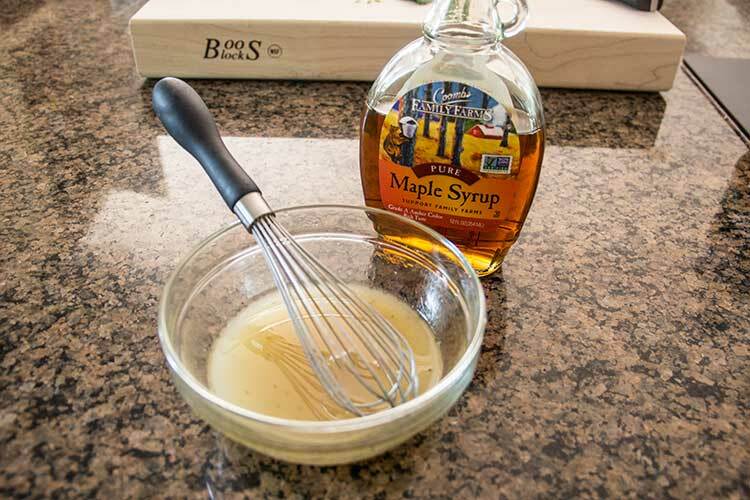 Add oil, vinegar, and maple syrup to a small bowl. Season with salt and pepper. Whisk until well combined. 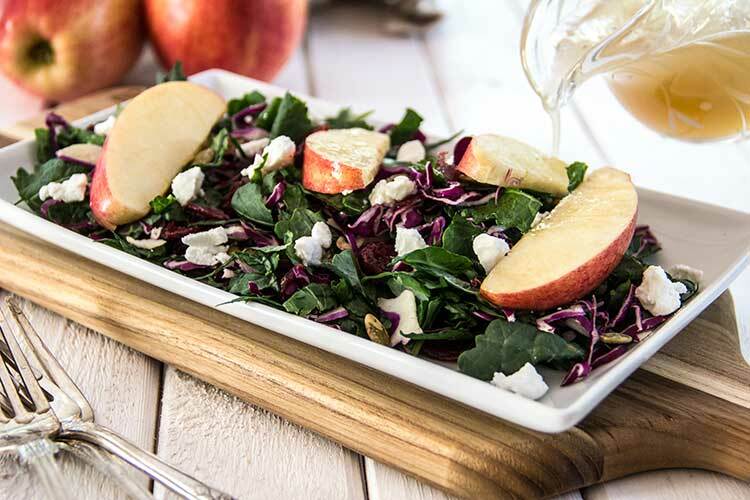 To a large mixing bowl, add the chopped baby kale, shredded cabbage, apple slices, and dried cranberries. 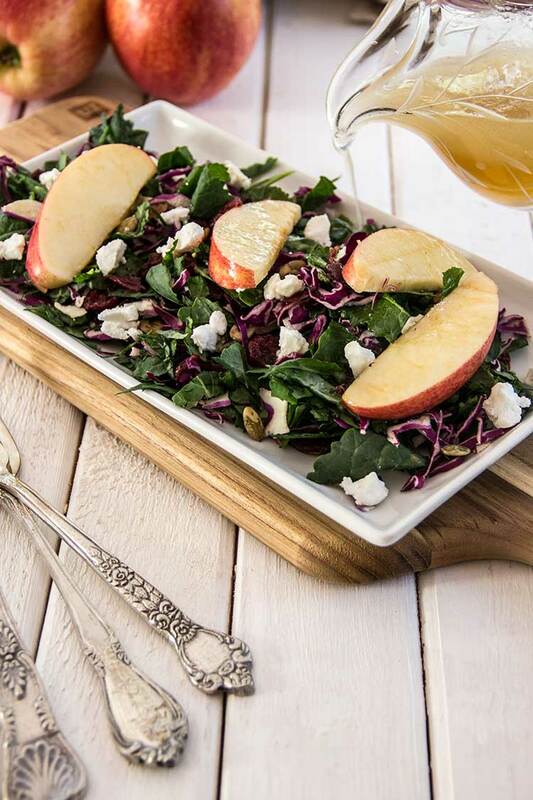 Pour in the maple dressing and mix until ingredients are well combined and well coated with dressing. Transfer salad to serving plates. Top salad with pumpkin seeds and crumbled goat cheese. Serve.